You are here: Home / Beekeeping / Local Flora – Surprising Unseen Beauty! Often new beekeepers start beekeeping to help the bees. And when they become experienced in beekeeping and get some insight in the local flora. They will notice that; bees do not need more beekeepers, they need a lot more flowers. More flowers are not something you first consider when you start beekeeping, you have to keep in mind your bees need to eat. Especially wild pollinators are very dependent on local ecosystems and for wild bees it can often be hard to compete against our efficient honey bee. When pollination is scarce and the honey bee will get hold on it. It is too hard for local pollinators to compete, honey bees are just too efficient and pollinate all the flowers in a very short time span. We just think, if I keep bees I will help nature but sometimes it can even do more harm. Off course, the damage on local wildlife depends on the area where your coming from. But for example, I live in one of the most densely populated areas in the netherlands. In my first year of beekeeping I noticed the bees had a hard time finding enough nectar and pollen to store in their hive. I started to cycle around in my neighborhood and started counting all the hives in a three kilometer radius (fly radius of the honey bee). I was stunned from how many hives I actually saw and my count was around sixteen and this was excluding my hives. My prime apiary is located in an agricultural area which also decreases biodiversity to make it even worse for me. Due to the over competition from other hives and the flora of the area. I was confronted with a gap between honey flows. I was necessary to feed my bees before the summer honey flow. It really determined me to investigate the flora in my local area and wanted to know how many hives my location could support. I concluded that the local area around my prime apiary can support two hives with enough honey on the end of the beekeeping season for the bees to start the winter. During my first year I had the opportunity to get another spot, which was around 4 kilometers away from my other stand. In the second year I moved 2 hives to the other place and to the end of the second beekeeping season I noticed the bees were thriving much better and I even could harvest (a little) honey from the two locations. So I advice beekeeper should scale his beekeeping operation according what his local area can support. And in addition to that it is in your and the bees best interest to know how many bees there are located in your area. It doesn’t matter if you are a starting beekeeper or have more experience. 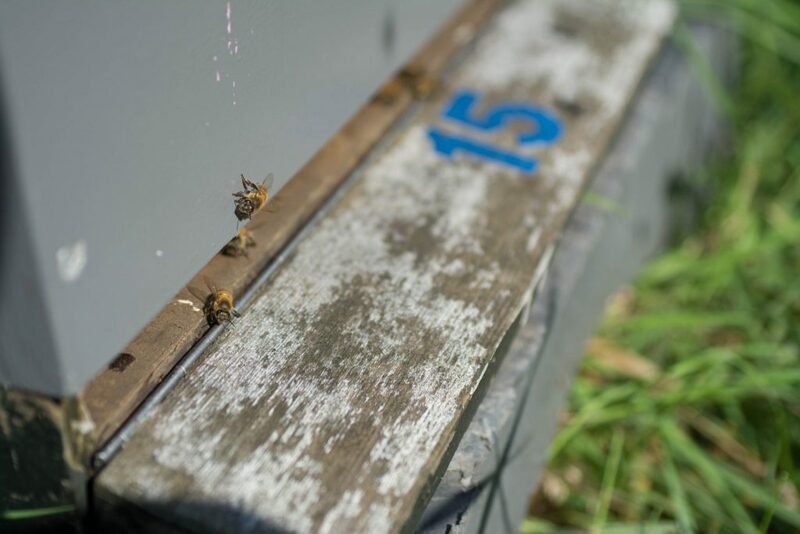 It is key to understand the local flora around your hives. You do not have to be a botanical expert, I am far from one. But when you start to keep bees, invest in some botanical books on the native flora in your area. It is important to know what can be expected and you can plan in advance for the bees. What helped me is to make a small honey flow calendar. There are a few steps to make such calendar. Determine what area you want to start investigating. I did this first for my prime apiary, so we can take this as center and we know the fly radius of bees is 3 km one direction. So we draw a circle with a radius of 3 km and end up with a area of 28 square/km. This seems like a lot of ground to cover, but you can easily observe the area by bike. Now the fun parts start, cycling through the area and investigate what you thought was a well known world. When I first did this, I was amazed by all what I didn’t saw before. I was amazed by how many different trees there actually were in my area. I even noticed beautiful ancient Dutch Elm’s as tall as some apartment building located beside a highway or pretty small rivers with amazing wild flowers behind factory lots. Mapping the flora in your area can seem as a daunting task, but actually it is a lot of fun. The best thing is to just start, begin by taking a print out of google maps and draw a circle on it. The center should be your apiary or the location for your future hive. I like to start big, start by counting trees which you know is a good food source for the bees and mark them on your map. For example mark willow rows besides small trenches and linden trees in the city center. Trees are easier to investigate than flowers, because flowers pop up and vanish during the season. After the trees start make a start with wildflowers. The best is to take at least a year and wander through your area in different times during the beekeeping season. You can map early spring flowers, summer blooming trees and even late september flowers, e.g. the hedera ivy can even blossom until late november. Nature is full of abundance and surprises and still keeps amazing me. As you start to get a decent picture of your area, it is possible to find any gaps in honey flows. For me this is during the end of spring and just before the blossoming of the linden tree in early June. You can anticipate in the growth of the beehives by feeding them a pollen substitute or give them a sugar extract. Also it is a option to move your hive to a different location where you know honey flow is abundant. If you live in an agricultural area you should talk to the farmer. Sometimes they plant flowers to fix nitrogen in the ground, the great thing about these flowers is they are a great food source for bees. In the long run you can plant additional trees to improve your surroundings. It is possible to plant different trees which give sufficient nectar in different times of the year. Be sure these plants are native to your local surroundings. You do not want to introduce a aggressive exotic plant which can disrupt local flora and fauna. In my area local beekeepers are considering planting spruce wood besides highways and train tracks. This can be a easy way to improve your local flora. How great would it be to see your native flora flourish in the coming years. Be aware it can take several years before developing a detailed honey flow map or calendar. As bees work in cycles, nature does the same. Some flowers will blossom bi-annually and to make it more unpredictable nature is ever changing. New trees will start to blossom or a new kind of herbaceous plant is migrating to your area by wind. So mapping honey flows is a never ending task, but one consolidation the same applies for beekeeping. Flora is as important as the competition of other hives in your area. When you observe your local flora, also be aware of hidden bee hives near parks, allotments or other open spaces. Ask your local beekeeping club which members live around your place. And meet up with them, just discuss the matter and they are open to give advice or their recommendation on if the spot is suitable for another hive. Sometimes people can act defensive when you approach them with the interest, of beekeeping near their apiary. But it is better to be open in advance than get into a dispute afterwards. If you see other hives you can note them onto your map. If you question if your local flora can support all these hives. it is really dependent on the area you are in. In ancient landscapes with abundant nature it is likely more possible than in agricultural areas with a lot of monocultures. As you start with observing nature around you, different kind of trees will become familiar to you. For me before starting beekeeping a tree was just a tree and a flower was just white, red or blue. But as time continues and you become open to the world around you, nature will show you scenes which are mostly unseen by others. You start to wonder why you didn’t notice all the biodiversity around you earlier in life. If you already started your beekeeping journey, you are now familiar with bee fever. When you’r observations continue, it becomes a habit to start checking patches of flowers for honey bees. As I observed the more small details in nature, I became aware of different kinds of pollinators. And I was stunned, those little insects are sometimes even prettier than our own honey bee (no offense). And off course, as curious as beekeepers are, I started googling. Before I only knew bumblebees as wild pollinators, but it was stunned with the fact we have 352 different solitary bees in the Netherlands. The bad news was these beautiful pollinators are threatened in nature which is in decline. Most of these pollinators are already vanished from certain sight and only isolated communities were remaining. Our honey bee can be a big rival of the local pollinators. Most solitary bees depend on one or just a few plants for survival. And you can imagine if there whole existence is based on one plant it is sad if all those flowers are gone in mere days after the honey bees came by. This is not the only reason why solitary bees have it difficult. Climate change is also deregulating their breeding patterns. Sometimes the bees awake too early due to warm weather. And when they do no flowers which they feed on are available. As beekeepers we should not only take care of our own bees. But we should also care for our local native bees. Often they depends on the local flora and we have the responsibility to be aware what impact our honey bee can have. What we can do as beekeepers is seed extra flowers and provide housing for the bees to nest in. These so called bee hotels can be purchased or made by hand. Nature is ever changing, we often do not realize what happens in front of us. Often observance from nature does not go further than new leafs on trees or you hear people complaining from a pollen allergy. As a beekeeper you have the wonderful opportunity to wander through nature with a purpose and map your local area for native flora. Start by cycling and begin by just observing, observe the different trees and shapes they have. Look through the patches of grass, notice the different flowers and different colors. If this is too overwhelming begin small, only look at the trees. When I started my botanical knowledge was negligible. I just started by walking through the streets and take notice of the trees. This exercise can even be done during everyday activities. When you walk to the shop, or cycle to the train. Time is no excuse. When you have good understanding about your surroundings and you have mapped the honey flows. It is possible to implement future improvements. Every year I guerilla plant some hedera ivy’s next to the train track or plant some bee trees close to some bushes which will not be mowed. By paying attention to your native flora, a surprising world will unfold itself. You can secure enough honey flow for your honey bees and do something good to native pollinators. Do not wait until others will do it. If you want to see change in this world, you must start your own movement. So explore, wander and if possible plant something. And most important enjoy it!